Situated in Kent, Buckmore Park is one of the most famous circuits in the country and what I’d call a driver’s track. One of the most famous circuits in the country, they’re also very proud of the fact that the likes of Lewis Hamilton and Jenson Button raced there in their younger years (and rightly so!). It’s easy enough to learn your way around Buckmore (check our Buckmore Park Track Guide below) but far more difficult to master than most people give it credit for. Let’s not start there though – let’s talk about the important things… namely how to get there and how good their cafe is. As far as facilities go, Buckmore Park is one of the better places that we’ve had the pleasure of visiting. There’s a kart shop on site, along with a good sized cafe area (which serves decent food and snacks), along with a couple of really big briefing rooms. I must have given Buckmore the pleasure of my custom a good 15 or 20 times for arrive and drive sessions in the last few years and it’s always very clean and has a great atmosphere. Briefings are as light hearted as they can be with a good smattering of jokes and a real focus on having fun without killing each other. The marshals tend to follow suit with this. Not too strict but unlikely to stand for any really bad driving, which is just the way it should be – firm but fair. My experience with owner driver days is limited (they don’t run a pro-kart series) but it’s on the Club100 calendar so I’ve been able to experience the track at a more ‘professional’ level. The main thing to note with this is that the pit-lane moves from next to the club house to the bottom of the hill. This is done because it has to be – there simple isn’t space for a full sized paddock in the normal pit lane – but does add to the fun as the entry and exit are on the fastest downhill section of the track. And on that note, what about the circuit itself? Quite simply, it’s fantastic. It has a vast array of undulating twists and turns spread over 1500 or so metres of up and downhill sections and is great for both beginner and seasoned drivers. There are a number of flat out sections, mixed in with mid speed corners and hairpins. Mix in plenty of width and you’ve got what I can only describe as heaven for drivers who like to overtake! As always, bear in mind that I’m certainly not a pro when it comes to karting so there are drivers with far more skill that would disagree with some of what I’ll say. This circuit guide is aimed to beginner to intermediate drivers who are either visiting Buckmore Park for the first time or still learning and want some tips to help them go faster. Assume that you’re in a 4-stroke arrive and drive kart. The start finish line is at the top of the circuit, is usually taken flat out, and leads quite quickly into turns 1 and 2. These are essentially one corner – Conways – and in dry weather can be taken pretty much flat out. You’ll want to be on the left hand side of the track as you go over the start finish line and, just before turn 1, drift over to the right so that you enter the corner hugging the kerb. This gives you a quick entrance and also means that you’re less likely to get someone diving up the inside. As you reach the middle of the corner the kart should naturally start to drift out to the left – that’s fine – but as you exit turn 2 you want to move back to the inside of the corner and then accelerate, drift over to the left of the track, hopefully still going flat out, and heading down towards the first hairpin. If you’re chasing someone down and have managed to get a good enough run out of turn 2 then chances are you’ll be able to pull alongside, which will alter your line slightly as you belt one up the inside. The braking point for Hairpin 1 tends to be around the line in the Tarmac but be careful – this is the most dangerous corner and where you see most people spin out. Get your braking done and then aim for a late apex so you can move the kart out to the left of the track as you exit. There’s a handy kerb here that you should end up touching so you’ll know when you’ve got the perfect line nailed. No time to rest though – Hairpin 2 hits you VERY quickly. You’ll need to move out to the right of the track and then brake a little bit late as the exit of this corner is a late apex. Missing this means that you can’t get on the power as early and lose time as you head into the fastest part of the track. Again, there’s an exit kerb on the right hand side that you want to aim for (don’t run wide though as you’ll lose loads of time) and from there it’s foot down, full throttle, into the Esses. The first part of this S-bend needs to be taken early, using the kerb, before driving straight over the middle section. This is done flat out and will let you drift out to the left hand side and head down the hill ready for Symes Sweep. This is a very fast section, so you need to be careful, and requires you moving over to the right, hitting the apex of the corner, and exiting a couple of kart widths from the right hand side of the track. If you’ve got Symes Sweep nailed you’ll be able to fly into Pullmans on the left hand side, using the brakes a little, and hitting the exit of the corner as straight as possible and on the left hand side of the track. If you ran wide in Symes Sweep then you’ll be really slow through here so practice getting that right. Assuming you’re on the money you’re now heading down to paddock corner at pace. This is at the bottom of the hill and needs some heavy but careful braking. I usually try and take it from far over on the left but if someone’s close behind you then go defensive and stay a bit further right. Brake early, set yourself up for the turn, and then get back on the power through the middle of the corner so you can get the best possible exit speed, naturally moving to the left of the track as you do. Next up is Garda, which is at the top of a small hill and is key to a good lap time – this is where most beginners lose out. You’ll naturally be on the left hand side of the track and will want to brake reasonably late. Hit the apex of the corner as late as you dare and then get yourself 3/4 of the way over to the right of the track ready to go left into Senna Chicane. This is at the bottom of the hill so you need to carry as much speed as possible. Hit the chicane in the middle, drift out to the right, and keep the power down. As you head up the hill you’ll see Cafe Corner – which you take as close to the fence as you dare, flat out, and keep powering as you see the outside kerb (which isn’t a corner but does catch beginners out) and head back towards the start finish line. I hope you find this Buckmore Park track guide useful – feel free to leave a comment below if you have any questions or changes! 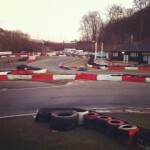 This lap of Buckmore Park was shot at the opening race of the 2012 Club 100 series using a GoPro HD Hero in February 2012. Head to the M20 and get off at Junction 6. You then need the A229 towards the M2 and, as you get to the top of the hill, you’ll see some signs for the circuit. If you’re on the M2, leave at junction 3 and go straight over the roundabout (which crosses the A229). Turn left at the next roundabout and follow the signs into Buckmore Park.